384 pages, color and black and white photos. It is a rare and wondrous thing when your hobby and passion leads you to a place where you find yourself driven to pursue discover ever deepening levels of historical and technical detail of a subject and it leads to newer discoveries. It's even more satisfying sometimes when you even uncover information once thought to be lost forever to the ravages of time and a world war. 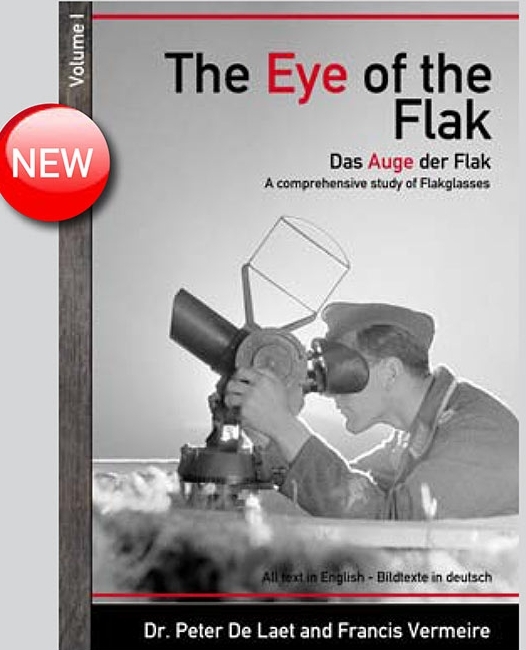 A new publication, "The Eye of the Flak" by Dr. Peter DeLaet and Francis Vermeire, is just that. Extensively researched, The Eye presents a rich history of the development of the legendary German "Dopple Fernrohr" D. F. 10 x 80 Flak binocular. DeLaet and Vermeire tackle a subject that far surpasses a simple collection of photos, technical annotations and anecdotes. It sets a new definitive standard for research and technical detail on the subject of military binoculars and it is no coincidence that the talents, expertise and guidance of Drs Stephan Rohan (Eyes of the Wehrmacht) and Hans T. Seeger (MilitaÌˆrische FernglaÌˆser und Fernrohre in Heer, Luftwaffe und Marine, and others) who pioneered fundamental written guides to military optical devices. Military binocular enthusiasts (including many of those dear readers right here on Cloudy Nights) are quite familiar with those often-seen, but not so well understood "Flakglasses": those large aperture German 10x80 binoculars mounted on heavy duty tripods, originally meant for aerial observation by German forces during the second world war in support of anti-aircraft units. Binocular enthusiasts have long recognized the value of these old binoculars and their ease of use, and servicing and restoration as well as their flexibility for stargazing and common daylight observation. But DeLaet and Vermeire illustrate that there is more. So much more. After reading The Eye, owners may wish to rethink any notions of repainting, refurbishing or otherwise altering (other than servicing the lenses and prisms as necessary) their amazing 10 x 80s, with a whole new appreciation once they learn that the paint, markings and other features all have an amazing story to tell on their own. Through the use of modern photography of beautifully surviving examples, original technical factory drawings, primary source documentation, wartime correspondence between factory officials and agents of the German war machine, reprints of vintage German technical and instructional manuals and publications, propagandistic posters and materials of the time, a cohesive picture of scientific ingenuity due to urgency of wartime conditions becomes apparent. "A comprehensive study of Flakglasses" as listed in the subtitle, is indeed an understatement. It is an astounding volume (first in a series), that takes the reader into a level of enriched historical context and technical detail that is deep as it is vast, and is all the more overwhelming when you acknowledge these two authors still retain the ability to tell a good story. The forthcoming second volume will focus on more specifics related to the interests of collectors, but in all honesty, there is enough detail here to greatly impact the collecting world with this work all by itself. That story begins as early as the late nineteenth century and leading up to the anti-aircraft requirements of the armies about to participate in the War to End All Wars, up through the mid-war period and the economical intrigue between competing manufacturing firms for military contracts, and throughout the Second World War. The story is counterbalanced with the commensurate and lavish attention to detail of changes to the components, color schemes, modifications, and maintenance and repair methods and regulations. However, DeLaet and Vermeire also know when to incorporate the human aspects of the 10 x 80's importance to Germany's war effort, as they enlist the remembrances of a unique subject matter expert: a (then) very young member of the Third Reich's many aerial observation crews whose jobs were not only to pick out and report incoming bombing formations, but who also put in the charge of cleaning and caring for what were for the time, cutting-edge optical technology. The authors also are keenly aware of the depth of human destruction and despair that was visited upon such cities as Cologne and Dresden by Allied bombing operations by 1945. As this is primarily a European product, the subject of strategic bombing of German civilians is still a deeply and hotly debated issue to this day and U.S. readers may sense the authors walking what to them must have been a very fine line, for an international audience. I found these discussions to sometimes overly dominate much of the text (and sub-text), however, as with anything else within the human experience, all aspects of such a cataclysmic war must be taken into account to understand scope and context. You don't get to pick and choose what happened - it is what it is. Some other details having to do with distribution and transportation of the products to the front lines tend to take a left turn, but still, you are left in awe that the authors found this information in the first place. The work can also be seen as a cultural record, inasmuch the illustrations, and text illuminates the social and societal norms, and daily activities of the flak operators, observers, and support who were a significant and critical portion of the German home-front population. Putting that aside momentarily and delving back into the richness of the content, collectors, historians, and enthusiasts will be thrilled to uncover mysteries of letter, code, and various markings and what was used for what purpose, and how. DeLaet and Vermeire have done all the hard work, finally and definitively separating fact from fiction, theory, common myths, and plain old 'Tall Tales' surrounding these binoculars. Steel vs. Aluminum? Aluminum vs. Bakelite? Field Grey vs. Dark Yellow? One manufacturer quality over another? Why so many? Why so few? Is it rare or isn't it? It's all here, dear reader, and much more. The reader is immersed in a wartime world of production, distribution, and designation and one will find oneself amazed at all the ingenious ways with which the Germany army, air force, and navy employed large binoculars in multiple modes and with an astounding variety of applications, probably never known to most. This is a story of the 10 x 80, but what The Eye really does is what the title states: The reality of it is, the book is the Story of Flak Itself, with all it's concepts, tools, theories, attempts, successes and failures. The authors acknowledged that the 10 x 80 story had to be expanded into all aspects of flak development during the Second World War as they came upon the epiphany that the production technology inherent in these optical systems were in sharp parallel to the downward changing fortunes of Germany as the war progressed as well as the need to counteract the changing tactics and advances of the United States Strategic Air Forces. Optic as chronological artifact, as it were. The Eye is a modern masterwork of research and historical documentation that ranks alongside the works of Seeger and Rohan, and should not be missed by any serious collector, enthusiast, or historian. DeLaet and Vermeire take great pains and pride in providing a clear outline of conceptual terms, meanings, and assumptions including the methodology of numbering systems, itself no mean feat, and the reader will be richly rewarded if he or she takes full advantage of the author's preliminary explanations. As noted, this is the first of at least a two part volume promised for the future, and as with all things, research is a journey of constant discovery, therefore some items still undergoing examination and/or needing additional expansion will have to wait until then, but The Eye volume I will keep most readers more than engaged with its exquisite level of detail and above all, factual storytelling. I am aware that the book is selling very quickly in the European market. To order your own limited edition copy, visit http://www.flakfernrohr.com. No . A big pupil allows the observer to scan a wider field without having the eyes' irises clip the outer parts of the field of view. That is true for any age/ eye pupil size.